My favorite spring snow goose hunting condition is south winds and sunny skies. 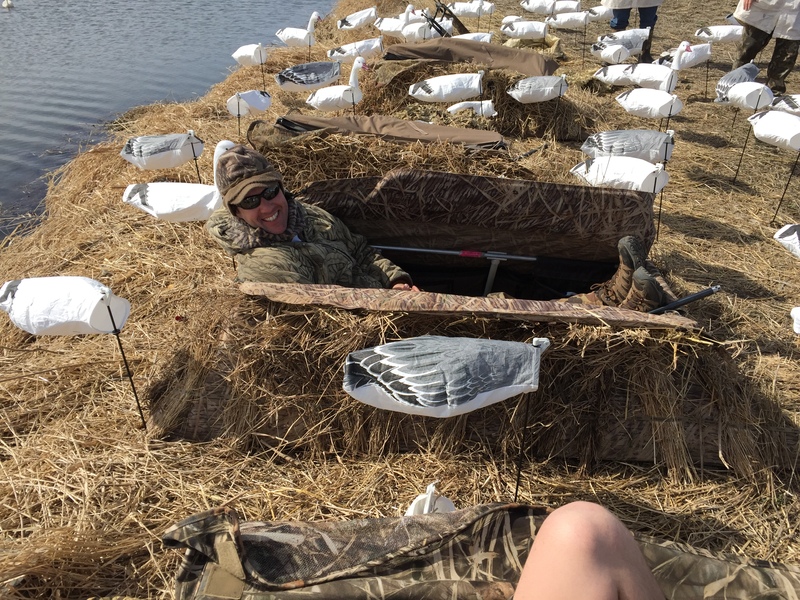 It is not only relaxing, but it is simply the deadliest weather when it comes to decoying large flocks of snow geese. In the article below I will describe the setup that I run under these conditions that has proven itself over and over again. If you use these tips on your next hunt with south winds and sunny skies you will kill more snow geese! Water surrounded by crops. Preferably corn but beans will do. Pasture ponds can also be good. I will put out the largest spread of decoys that I can given that in the spring, south winds and sunny means a migration is going to happen. I will arrange the decoys in a large blob with two stringers running down wind and nearly touching at the farthest point (shown in the SnoMen DVD or on YouTube snow goose decoy spread). This decoy spread is very versatile and allows you to move the spread easily to accommodate a wind change. The most realistic decoys will be placed in the upper 1/3 of the spread where I expect the birds to finish. I will run the largest spread of supported and fully collapsible Feathertek wind sock decoys that I can put out. I prefer to run 20% headed snow goose decoys. We typically run two SnoMachine electronic snow goose e-callers. One SnoMachine e-caller will be in the lower half (down wind side) of the spread on low volume with two to four speakers pointing vertical. When the birds are dropping down from migration altitude, there is complete sound coverage in the spread yet the sound is not a dominant volume level. The second SnoMachine electronic snow goose call will have four speakers, three speakers pointing at 45 degrees in all directions with the fourth speaker pointing directly at the snow geese when fully decoying. This caller will be placed in front of the blinds ten yards and the volume will be louder than the down wind e-caller but not so loud as to blow the geese out of the field. Geese focus in on two things when finishing, motion and sound. Keep the motion and the loudest e-caller near the blinds. I will shut the SnoMachine e-caller off between flocks via a remote until I see or hear snow geese. I will maximize the amount of motion (rotary machines and flyers) in my spread and make sure most of it is within 20 yards of the blind. The birds will be new and focusing in on the rotary machines and flyers. Three rotary machines and a dozen flyers is what I will normally run. I will let these run all day. I will be in a comfortable layout blind concealed to the max! The best hunting on a migration day can be at high noon, if possible hunt all day. If birds are not finishing, most likely they are seeing you! The next time you are blessed with south winds and sunny skies in the spring, head to the field and use the tips above and you will kill more snow geese! SnoMen - Feet Down and UnPlugged!